Q: Does Airbase Lomax Carpet & Tile Mart install, or do I have to find my own installer? A: We can absolutely install everything we stock and 99% of what we sell! In addition to the best selection of cash and carry flooring at the lowest prices, we are your one stop for new flooring installed in your home. Avoid headaches dealing with private contractors. In many cases we can install your flooring purchase the very NEXT DAY! Please check with your local store for specific detail and seasonal availability. Store phone numbers are available HERE. Q: Does Airbase Lomax Carpet & Tile Mart provide estimates? A: Sure thing, we understand flooring is a big purchase and you need some ballpark idea of the costs early in the process. At the time of your visit to one of our locations one of our flooring experts will give you their best estimated cost of your installation based on the room, material selection, and size information you provide. This estimate is provided for planning purposes only and is non-binding. The total cost may vary due to adjustments in actual square footage required and/or additional labor charges required after your final measurement has been completed. Q: Can Airbase Lomax Carpet & Tile Mart come out and measure my home for new flooring? A: YES! We use OUR own in-house measurers and we guarantee our measurements will be true and accurate. If we over measure, we will return to you the cost of any unused goods! Our measurer will contact you within 48-72 hours to schedule a time that works for you. Normally they provide a two hour window, not an appointment time. Once the measurer has been to your home and completed taking your room measurements, they will submit them to the installation manager at the store you are working with. The installation manager will review them for accuracy, and work with your salesman to refine your estimate into a final quote. Once a quote has been prepared , one of our friendly office staff will contact you to review the final quote. A: Yes we do! Once the measurer has been to your home and completed taking your room measurements, they will submit them to the installation manager at the store you are working with. The installation manager will review them for accuracy, and work with your sales associate to refine your estimate into a final quote. Once a quote has been prepared, one of our friendly office staff will contact you to review the final quote. A quote represents the final dollar amount you will pay for your flooring since we now have exact measurements and can move forward. Q: I received my quote, what now? A: Before we order any products to install your home, we must have your verbal approval on the exact sizes and costs associated with your job and a deposit of at least 50%. If you’ve not been contacted within two days after your measure, please call the store you are working with and ask to speak to the office manager. If price approval is delayed, special orders will not be placed and your installation might not proceed as planned with your sales associate. We require a minimum of half down to hold the product, hold the date on the installation schedule and complete the in-home measurement. The balance is due in full after customer approval of final measured quote. As a reminder, Custom Labor “direct pays” to the installer (if applicable) are due the day of installation. We require full payment a minimum of 24 hours in advance of the installation day/time. Scheduled installation dates are first come first serve, based on product and installer availability, and occasionally subject to change. A: Yes we can! Take-up, removal, stairs, metal trim, sub-floor prep or furniture moving may require extra labor service charges which are paid direct to our installers, not Airbase Lomax Carpet & Tile Mart. These charges will be clearly identified on your order. Please understand that installers are only guaranteed to perform work shown on the order. Any extra work required during installation that has not been discussed with your sales associate or installation manager will require additional charges and may not be performed on your installation day if the proper resources have not been scheduled ahead of time. Our installer will make every effort to accommodate your needs. Q: Can you remove my old flooring? A: Yes. Upon request, we will take up and dispose of the existing flooring for a modest charge. Please let Airbase Lomax Carpet & Tile Mart staff know early in the process that you require old carpeting or other flooring removed to make room for your newly purchased flooring. Installers will only dispose of old flooring they take up. Some exclusions may apply. Q: Can you move my furniture and replace it when your done? A: Yes. We know many companies wont do this, but we want to provide any service you need to make this the best flooring experience possible. We just ask that if Airbase Lomax Carpet & Tile Mart will be moving your furniture, please remove all breakable items and disconnect any wiring such as stereo and TV wires. In bedrooms, please strip beds and remove all items from the tops of dressers and bottoms of closets. In kitchen and utility rooms please disconnect the washer, dryer, refrigerator and all gas appliances. Airbase Lomax Carpet & Tile Mart installers are not responsible for disconnecting or reconnecting these items. Airbase Lomax Carpet & Tile Mart Installers WILL NOT dismantle or move waterbeds, grandfather clocks, antiques , etc. Please ask your local store for specific details about items you want moved. Q: Can you custom bind a rug or carpet for me in any size? A: Yes we can! Each one of our stores offers custom binding, many locations can do it while you wait! 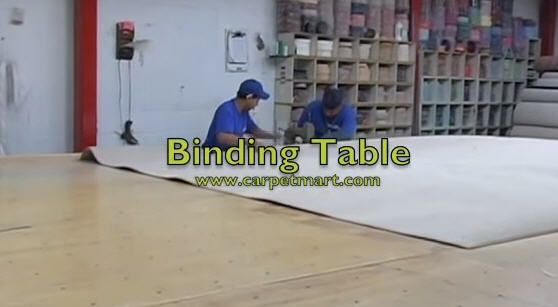 We have specially built binding tables (much like large hockey tables) they we use to easily move large pieces of carpet to apply the binding material of your choice. We have dozen of colors and styles to choose from. You can bring us your sizes and we will cut and bind per your instructions or we can come to your home and custom fit the carpet, return with it to our store for finishing and re-deliver and lay out per your instructions. Q: Can you bind carpeting or rugs purchased elsewhere? A: In some cases, we can. Please check with your local store. Each case is handled on a case by case basis. We will not do custom work on items that could be easily damaged, or are in poor condition. Q: Cool! Can I see it in action? Airbase Lomax Carpet & Tile Mart accepts payments by Visa, MasterCard, American Express, Discover, approved financing, and with prior arrangement PayPal. All balances due must be paid in full upon completion of your flooring installation, this includes amounts due to Airbase Lomax Carpet & Tile Mart and directly to the installer. If you have any further questions or concerns, please contact your local Airbase Lomax Carpet & Tile Mart store! Enjoy your new flooring from Airbase Lomax Carpet & Tile Mart!